2010 may be the most threatening year to confront American sovereignty in our nation's history. For the past ten years I have been chairman of the Americans for Sovereignty® project at Council for America®. And never before have I witnessed a series of events that could so seriously undermine American sovereignty than in the coming year. Fortunately, we have found in our own monthly survey data a growing alarm among American citizens. Our most recent survey specifically commissioned for the Conservative Political Action Conference (CPAC), found deepening opposition to the anti-sovereignty agenda of the Obama administration. This included 98% opposition to the Law of the Sea Treaty and also over 90% opposed to the United States joining the International Criminal Court. Also Americans for Sovereignty® has just released our annual survey of all members of the United States Congress and how they voted in the past year on Sovereignty related issues. Complimentary copies of that survey are available here at CPAC. I always expected the Obama Administration to usher in a sweeping anti-sovereignty agenda, so I was not surprised by what has transpired. But fortunately the health care fiasco coupled with the mismanagement of economic policy and incompetence in dealing with international problems all combined to mitigate the damage done thus far by the Obama Administration to American sovereignty. The warning signs of an impending assault on American sovereignty arose early with the administration's key legal appointees. From the choice of Elena Kagan as the solicitor general at the Department of Justice, to Prof. Harold Koh as the chief legal guru at the Department of State, to Sonya Sotomayer to the Supreme Court---a distinct pattern emerged. The Obama Administration fervently embraced internationalist jurisprudence in contrast to our traditional constitutional perspective that placed a premium on American sovereignty. For example, Justice Sotomayer proclaimed at the end of her confirmation hearings that we should " consider the ideas expressed in the decisions of foreign courts" in "our understanding of our constitutional rights." I think we could all take exception to this transnational position and continue to assert that we can quite thoroughly understand our constitutional rights based on our own 250 year legal history. Few concepts undermine American sovereignty more effectively than the transnational legal theories that place the Constitution at the same level or even subservient to foreign legal traditions. German and French legal thinking may be amusing to law professors (like former Professor Obama), but they have no place in arguments before the Supreme Court. Justice Anthony Scalia effectively mocked this legal notion as taking "the prize for the Courts most feeble effort" to justify decisions based "upon nothing but the personal views of its members." Beyond embracing alien legal traditions, Obama Administration officials have also embraced a whole series of international treaties that undermine American sovereignty. Quite probably only the health care congestion in the Senate during the past year prevented any of these dangerous agreements from being brought to the floor of the Senate. I will only touch on a few of these treaties to provide some lines of argument you might find useful in communicating with your Senators. First in terms of danger of being ratified is the Law of the Sea Treaty which unfortunately has had some bipartisan support. The treaty transfers jurisdiction over the high seas to a new United Nations entity (the Seabed Authority) that would be self-governing without an American veto power over its actions. By imposing taxes on mineral production it will provide an endless stream of revenue for all kinds of international mischief and corruption, mostly at the expense of American companies. The United States has always effectively guaranteed our own rights on the high seas; so becoming subservient to a new international organization will not enhance these rights. For more information on this issue, I draw your attention to a critical assessment that I wrote of the Law of the Sea Treaty that is available from Americans for Sovereignty®. Next is the Kyoto Global Warming Treaty that cooling temperatures have transformed into the Climate Change Treaty. Knowing this would never be ratified by the Senate, it further transformed itself into the Cap and Trade legislation that barely passed the House last year. The net effect of the treaty, like the House bill, is to stymie American economic growth through carbon emission restrictions, while giving a pass to India and China, two of the globe's largest carbon emitting countries. Finally we have the International Criminal Court (ICC), that even the Clinton Administration would not submit to the Senate for ratification. This is probably the most indefensible treaty because it would prospectively subject American servicemen overseas to being prosecuted before some international kangaroo court. And what Obama Administration proponents of this court have never explained (because they cannot) is why American servicemen or other US citizens hauled before this court would enjoy fewer Constitutional legal protections than the Obama Administration insists upon providing to "unlawful enemy combatants," i.e. terrorists such as Khalid Sheik Mohammed. Thus I urge you to use this argument to press upon your elected officials to both reject the ICC and also reject civilian trails for terrorists. This only makes a mockery of real justice. So the basic question must arise: why is the American legal system becoming subservient to a nebulous international legal order? This surely constitutes globalism run amuck. I have reluctantly concluded that the Obama Administration serves what they seem to believe is a higher authority than the American Constitution, namely some quixotic notions of international law allegedly reinforced by the opinion of mankind. Thus we have had the spectacle of President Obama wandering the globe apologizing for supposed American transgressions. It seems that while only in his first year of office as President of the United States he was already running for higher office, as quasi president of the world. This campaign began with his inauguration and during his first month in office he was nominated for the Nobel Peace Prize, which he successfully campaigned for. As President Obama stated all to auspiciously at his acceptance speech in December in Oslo, "I am at the beginning, and not the end, of my labors on the world stage." So America was warned of what may be coming next. And to a great extent we have seen his dangerous policies being implemented at the United Nations. With great fanfare the Obama Administration pledged to re-engage with the United Nations and thus reversed a Bush Administration policy and had the United States rejoin the widely discredited United Nations Human Rights Council, claiming we could be more effective inside than outside. What happened? Did Obama's representative to the council press for a resolution condemning Iranian suppression of their citizens? No, their priority was engagement with Iran and we now have not only more widespread repression in Iran, but also the regime is on the verge of developing nuclear weapons. No, engagement with evil regimes is not clever realpolitick, it only emboldens even more evil actions. Instead of condemning Iran in any of its thirty resolutions dealing with human rights abuses, the UN Human Rights Council instead condemned Israel 24 times-so much for our increased influence in the UN. At the UN it is time to stop voting "present" and instead follow the advice of Cong Ron Paul (in his House Resolution 1146) and in the future vote "absent" in the UN by withdrawing from the organization. More broadly it might be time for the UN, along with the terrorist trials, to move out of New York City. The same widespread indignation and outrage that arose last year over nationalizing health care could also arise over the assaults on American sovereignty. 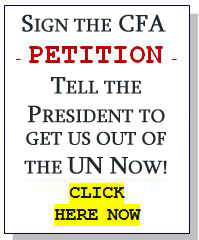 With your support in the coming months we can hopefully derail the anti-sovereignty agenda of the Obama Administration. We look forward to working with you in this endeavor.